Could there be a knife that never dulls? A gun with no moving parts? A broken clock that tells time? Whether it's showering without water, driving a car without an engine, or using a computer without electricity, these are high-level challenges for breakout thinking. 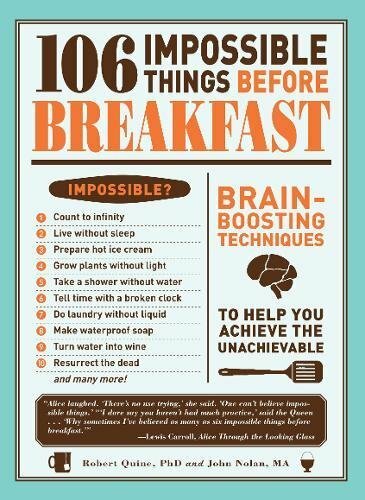 With this book, you'll stretch your minds and be primed to solve the next "impossible" problem before lunchtime. Dr. Michael Laufer received his Ph.D. in Mathematics from the City University of New York Graduate Center, where he broke new ground in mathematical physics. His doctoral research center on unsolved problems in mathematics and physics. John Nolan is employed by Personnel Decisions International, one of the world's leading global professional services consulting firms.